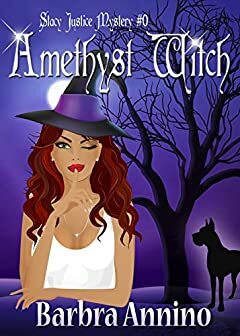 Stacy Justice is a young reporter who lives in Chicago, far away from the kooky small town of Amethyst, Illinois, where she was raised by a family of witches. Sheâ€™s perfectly content with her career, her cat, and her lack of a love life until her cousin informs her that their grandfather is deathly ill. Stacy road-trips home only to discover that her grandfather was poisoned, her grandmother has confessed to the crime, and thereâ€™s a new chief in town who is easy on the eyes, but tough on witches. Now, the reluctant witch must prove her grandmotherâ€™s innocence, save her grandfather from meeting an untimely end, and fight the killer thatâ€™s bent on destroying them all. This is the prequel novel to the Stacy Justice Witch Mysteriesâ€”where secrets only lead to more secrets and being the member of a family means that you make sacrifices that can lead to murder.